It all started with a head of cauliflower. I decided to chop it up into florets and season with olive oil, garlic, a little lemon and salt and pepper. After roasting in the oven, I decided it needed a little sprucing up. I added some sauteed onion but couldn’t stop there. I was in the mood for beans so I added two cups of cooked chickpeas that were in the fridge. I still wasn’t satisfied so I added some spinach for color and a handful of grated parmesan for the cheesy, salty flavor I felt was missing. Then I dug in! 1. Preheat oven to 450F. 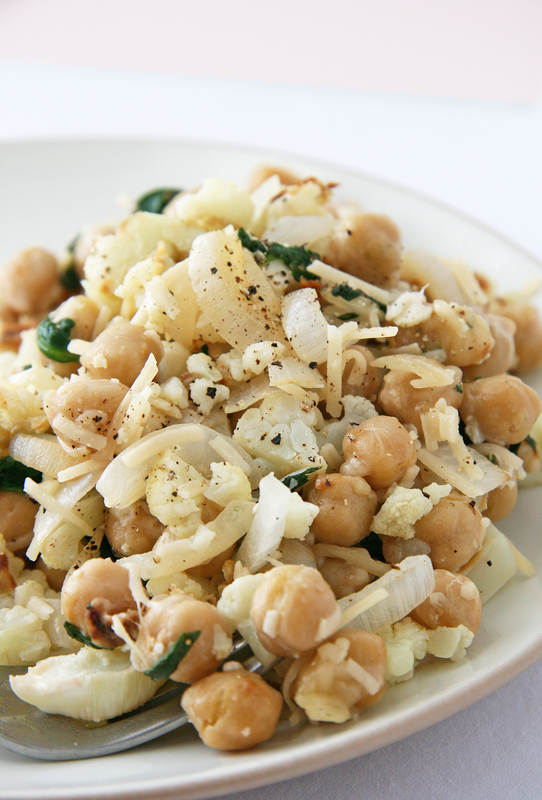 In a large bowl, toss chopped cauliflower with garlic, 2 Tbsp of olive oil, lemon juice and salt and pepper to taste. Line a large baking sheet with aluminum foil or grease then add cauliflower. Bake for 25 minutes, remove from oven and set aside. 2. In a large skillet, add remaining 2 tsp of olive oil over medium heat. Add onion and saute until transculent, about 3 minutes. Add spinach and garbanzo beans and cook until spinach is wilted, about 2 minutes. 3. Add in roasted cauliflower and stir to combine. Remove from heat, sprinkle in parmesan cheese. Taste and then season with salt and pepper to your liking, if desired. Enjoy! This recipe is featured on Amy’s Simply Sugar and Gluten Free blog for Slightly Indulgent Tuesdays this week! Thanks Mary! It was one of those happy accident recipes 🙂 Enjoy! Roasting cauliflower is by far my favorite way to prepare it. 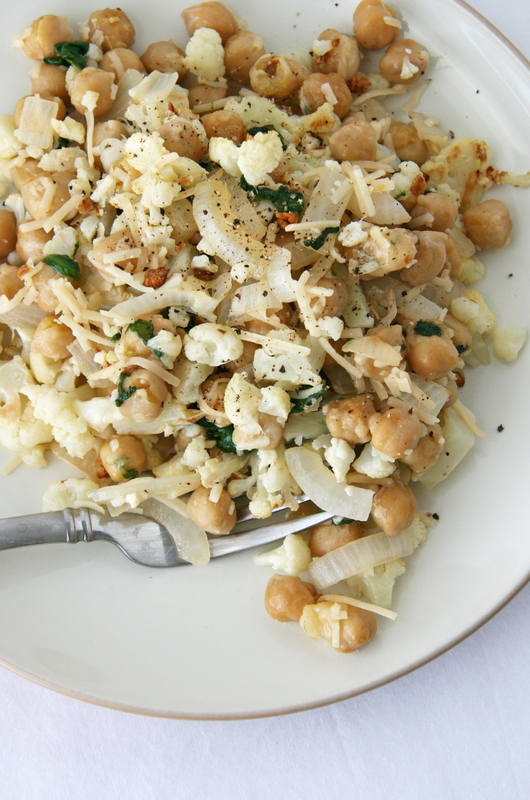 And parmesan + cauliflower = a match made in heaven. But really, what is parmesan NOT good with? This looks amazing. Not to mention, garbanzos have always been my favorite bean. Once again…LOVE your recipes! Thanks Jen! Sounds like this one is right up your alley 🙂 I agree about parmesan, it’s amazing! Let me know what you think about this one, if you get around to trying it!